There is a group of trolls posing as atheists who have been targeting me for some time. They have created many Twitter accounts in order to stalk and harass me and others. Not content with that, they even have created blogs with libelous content and have even followed me on Google + in order to harass me there. Well after investigating and contacting legal professionals, I was able to obtain a lot of details that these trolls are now panicking about. "Ellif_dwulfe" has apparently been reporting me and others for posting his home address which is publicly available. He claims that the address is not his, but reported "Studious Atheist's" wordpress site and is now publicly acknowledging that he is contacting Google support. This behavior indicates that he is concerned regarding the address which further proves that it is his. As "Studious Atheist" writes, "..he [Ellif_dwulfe] claims the address is not his yet he is clearly concerned that it is public. If it wasn't his, why would he even bother?" So 24 hours later google still haven't removed the posting of what's claimed to be my address from G+. Anyone know an email/support form? Desperate for attention Sacerdotus posts what he claims is my street address openly on his G+ profile. Stay classy Sac! "Ellif_Dwulfe" is clearly paranoid and suffering some serious mental distress. It is not normal for someone to be so paranoid. He literally thinks I am multiple accounts! Anyone who questions his views or that of "Rosa Rubicondior" - who is Esther Harrison - is automatically identified as being "one of my puppet accounts." Time to Stand Against a Bully"
Sacerdotus replies: I am no bully. This guy is clearly delusional. I have God and thousands of Twitter, Google +, Facebook, and blog readers as my witness that I never bully anyone. Rather, I am the recipient of bullying by "Ellif_dwulfe" and his friends. He even made a blog just to defame me and has publicly stated his intention to do so. "So far Sacerdotus is refusing to reconsider his actions in posting what he claims are my personal details to G+. He repeated the post this time with mention that i should be grateful the rest wasn't posted and that other information can be obtained with the right connections"
Sacerdotus replies: The information posted is public information that can be found on any people search sites. Moreover, if the details are not his, then why is he on the defensive? Lastly, I do have information from each of the trolls targeting me. These were obtained via my contacts and is completely legal. "Well sac, go on then. Do it. Post whatever else you claim to have because I refuse to be bullied. I was quite content having challenged your claims before to accept the mutal blocks/ignores and leave it at that. But you decided to start this. " Sacerdotus replies: Due to the legal proceedings by the petitioners, I cannot post anything else unless given authorization to do so. Only what is already public can be posted. However, anyone else who has been a target of "Ellif_dwulfe" and his friends can contact me and I will be more than happy to provide any information which can help them file a case against the aforementioned. Lastly, I did not "start" anything. I was unfairly targeted after the debate event where blogger Esther Harrison who blogs as "Rosa Rubicondior" ran away from debating me. Immediately, "Ellif_dwulfe" and others jumped to her defense targeting me for no reason. I never did anything to either party. "You Sacerdotus are a bully. Nothing more. If you don't like people criticising your posts block them and move on. If you don't like people calling you out then don't spread lies, false accuastions or personal information about them around." Sacerdotus replies: I am no such thing. Again, "ellif_dwulfe" and others have taken to task to be the defenders of "Rosa Rubicondior." They have targeted me for abuse, filed false reports against me, confused my identity with other accounts and have posted libelous content on blogs specifically created for the intent of character assassination. No lies have ever been spread by me and so forth. This claim stems from the bias "Ellif_dwulfe" and his need to defend the blogger "Rosa Rubicondior" despite blogger "Studious Atheist" showing incontrovertible evidence disputing "Rosa Rubicondior's " claims. Moreover, the restoration of my account after two years of permanent suspension while the account of "Rosa Rubicondior" remaining suspended is testament that I am the innocent party. Twitter Inc. was provided with the evidence showing that I did nothing wrong, nor controlled any accounts "Ellif_Dwulfe" et al claim I controlled. They had to restore my account. "Despite Sacerdotus claim the information is public and Uk public records confirm it this is simply not true and I repeat a challenge for him to provide a link to said public record. He has accused Rosa Rubicondior of child abuse frequently based on similar reasoning. A latino male went to high school years ago, there's no evidence he left highschool so he's still a minor (despite it being over 15 years since it's claimed the male in question graduated high school)." Sacerdotus replies: The information is indeed public. One can use Google to search for it. "Ellif_dwulfe" is not known for his reading comprehension skills. The "case of curt" is a post showing the obsession this troll named "Curt_ames" has with a Latino teenager. It is not accusing him of anything. Rather, it is highlighting his obsession while providing evidence for it. As for the post regarding "Rosa Rubicondior," I have made it clear numerous times that we do not know whether or not this male "Ellif_dwulfe" graduated high school or not. No high school diploma, transcript, letter from the high school itself has been produced by either "ellif_dwulfe" or "Rosa Rubicondior" confirming this. Instead, a link to the site Classmates is provided. Anyone who visits the site can clearly see that one can create an account easily without any barriers regarding verification. I can go now and created an account with a student named "Ellif Wolf," give him the age of 32 and then tell the world on my site that he is real and that he is "Rosa Rubicondior's" real identity. No one can be that stupid "ellif_dwulf." Until evidence from the school and/or Board of Education is provided that this male did graduate, is not a minor, then we must assume he is a minor since "Rosa Rubicondior" clearly linked him to a high school. This went on for nearly a year. Rosa Rubicondior stated on his/her blog that they'd donated money earned through google's ad-sense scheme to Oxfam. They even posted screenshots of appropriate payment confirmation pages. Sacerdotus challenged this with claims that Rosa never donated money, was acting as a middle man for donations to oxfam and scamming atheists by collecting money from site visitors and not passing it on. When Oxfam stated that the donations had been made on their twitter feed Sacerdotus claimed that meant they'd just been made. He then proceeded to threaten Oxfam with legal action if they confirmed the date the donations were made. Sacerdotus replies: What "Ellif_dwulfe" is referring to can be found here: http://www.sacerdotus.com/2013/10/atheist-scam-alert.html. Basically, after I saw "Rosa Rubicondior" directing people via Twitter to her blog in order to donate to Oxfam, I became suspicious. Why not send them directly to Oxfam? With this suspicion, I contacted Oxfam. The link I provided shows the screenshots of the exchange where I was told that no such person "Rosa Rubicondior" ever donated. Once I learned of this, that is when I posted this post (http://www.sacerdotus.com/2013/10/atheist-scam-alert.html). The situation did not end there. "Ellif_dwulfe" and his friends kept harassing @CatholicGadfly, an adjunct of Philosophy over it for months. Oxfam did tweet Catholicgadfly confirming the donation, but the wording was in the present-perfect tense indicating that the donation was made shortly before Oxfam made the tweet, not a year before. As for threatening Oxfam with legal action, I am not aware of this and do not know where "Ellif_dwulfe" got this idea from. I challenge him to present evidence for this claim of litigation on my part. "He's done the same with other's, when they didn't go on his podcast/radio show he accused them of running scams or tax fraud. "Sacerdotus calls for any atheist using popular hashtags on twitter to be mass reported. Sacerdotus replies: There is nothing wrong with warning others of known abusers on Twitter. As a matter of fact, Twitter now will allow users to share block lists. Others can even upload these block lists and automatically mass block the accounts on this list, see: https://blog.twitter.com/2015/sharing-block-lists-to-help-make-twitter-safer. As for these multiple accounts "ellif_duwulfe" is referring to, well each has behaved like a sock-puppet by overly defending a specific account, speaking on its behalf, engaging in abusive and trollish behavior and so forth. Each account behaves the same indicating that each is run by the same individual. Lastly, Dan Arel is not a renown author. He published a book from a petty secularist publishing company. That being said, I have no way of confirming any account that is named "Dan Arel" as being the person behind the book "Parenting without God." All I know of Dan is the typed character representation of him, nothing else. He refused to debate me and go on my media services. Therefore, I have no way of confirming via video that the accounts I contacted are the author behind "Parenting without God." On multiple occasions sacerdotus has threatened people with legal action against their "harrassment" of him. Claiming he has a great case etc Even that papers will arrive shortly. So far these paper's have not arrived. Sacerdotus replies: Yes, I am pursuing legal action against abusive trolls. This is not news. Those who follow my account and/or contact me privately have know of this for quite some time. Moreover, in the link "Ellif_duwlfe" provides, I never used those words. The word "shortly" is not even found. "Paper" is found twice. The relevant use of the word is dated April 19 and I wrote, "Again, the pursuant is responsible for filing and dealing with serving papers and so forth" This statement is does not state nor insinuated that "papers will arrive shortly." Again, "Ellif_Dwulfe" is being dishonest and demonstrating his lack of reading comprehension. "Sacerdotus makes vague threats of the "authorities"
Similar to other threats he has made against people he started the trend off with threats against Rosa Rubicondior of police involvement. vague comments about the authorities aware of Rosa and even claims he mailed the British embassy in New York about Rosa's behaviour. Sacerdotus replies: "Ellif_dwulfe" fails to understand the difference between a "threat" and a done action. Furthermore, contacting the authorities does not mean he or anyone else will be arrested on the spot. Life does not work that way. There is due process. "I'd make a statement about associating with this kind of person through advertising, but it seems no one's chosen his oh so generous offer of buying advertising on his blog etc. I can understand catholics and other's wanting to support a ministry and someone's evanglisasing. If they find joy in something and genuinely believe that it can benefit someone why wouldn't they want to share what they have? But, is this the kind of evangelising that encourages people to turn to Jesus and the Catholic Church? or away from it?" Why am I targeting Sacerdotus so much? Why do I encourage and am an accomplice in the harassment and defamation of Sacerdotus? Why do I and others have to create libelous blog postings instead of dealing with Sacerdotus privately? Why am I fighting the fight of "Rosa Rubicondior?" Why do I have to encourage and participate in the abuse towards Sacerdotus from darthnihilus1, freeatheism, naradee12, curt_ames et al? Why do I only see things through the inferences of "rosa Rubicondior?" UPDATE: As expected, "Ellif_Dwulfe" typically checks on me to see what I am doing. His IP is being tracked here, on my radio site, Youtube, Google + etc. He responded to this post. I will respond to each weak reply that he gave. "This is intended to be last post on Sacerdotus. With his abuse moving closer and closer to disturbingly personal where he's posting what he claims is my street address I've decided that refuting his claims, lies and standing up to his bullying is just no longer worth the time or effort. I will admit to have far to much on my plate at the moment and I've begun to develop real concerns for his actions if he did obtain genuine details. This blog will remain up for the foreseeable future for those curious about Sacerdotus. I was considering taking it down (see below for the reason why and further down for the reason I changed my mind.) but I probably won't be updating it further on Sacerdotus related content (this includes by his puppet accounts). I may when time permits move onto other subjects. Ok, due to real life problems I really can't handle the abuse and bullying by Sacerdotus. Including the repeated posting of what he claims is my address on his account on G+, a 2nd account doing so and the new posts by his studious atheist persona. I know it's expecting a lot from him but hopefully he'll just move on to a new victim and leave me be. I wouldn't under normal circumstances post this here but I want a 2nd record of what I've sent to limit.. shall we call them misunderstandings? The closest reponse is a new post about whining Trolls and "Don't Start none and won't be one". If only he'd followed his own advice and rather than attacked and accused people of various crimes or cowardice because they didn't debate him when he wanted to. Or the challenged his various lies. Sacerdotus replies: "Ellif_Dwulfe" has stated this before on a post dated Oct 20, 2014 (see:http://theblindwulf.blogspot.de/2014/10/dont-feed-troll-its-addictive.html). He wrote, "So now I need to focus on moving this to more varied topics, although it's likely I'll return to the subject of sacerdotus from time to time." As you can see, he is dishonest. He says he will stop defaming me, yet restarts his abuse whenever he gets the urge to do so. This is a sign of mental illness. He is clearly obsessed with me; so much in fact, that he is suffering distress. Again, he is panicking as he knows that I was not bluffing and will take down any troll who dares interfere with me and my interests. It would be wise if he takes down the blog if his only intent is to assassinate my character. His country has tougher laws than the United States. He can face up to two years in prison for his abuse. Is this worth it? I believe he has a child with autism and instead of focusing on his duties of caring for this gift from God, he instead focuses his energies on defaming me. Moreover, he accuses me of having puppet accounts but shows no evidence of this. No IP information from Twitter etc is shown. Instead we have screenshots and conjecture as his "evidence." As for the email, I have not checked my emails and have no seen this alleged email that "Ellif_dwulfe" claims to have sent me. This post was originally posted on June 10, which is two days before he allegedly sent me the email. Therefore, this post's original content (minus this update) was never a response to his email. In any event, I must confer with counsel first before responding as this individual is being investigated. Lastly, I must clarify that I have and never will be looking for a "new victim." The evidence shows that I am the victim of "Ellife_Dwulfe" and his friends. Note that my site was not created to "expose" "Ellif_dwulfe" or anyone else, unlike his blog which solely exists to post libelous content defaming me. He claims that a response to is email is "expecting much," but I had already tried to amicably resolve this situation and he refused; opting to continue his defamation and harassment (see: http://www.sacerdotus.com/2014/11/challenge-to-big-bad-online-wulfe.html. "Very well. I challenge Sacerdotus to link 2 examples of "people search sites" that show the information he posted as my address. He should also include the name he used. I ask anyone reading to conduct the same search to find my address on people search sites. I've no idea what last name Sacerdotus is using but he has called me "craig" a few times. Unless he believes "Ellif D'Wulfe" is my real name. The details are not mine, but they are still someone's who doesn't deserve the risk of abuse. It also bugs me that the only reason you're resorting to the posting of such personal details is to bully. In response to my challenge to post the further information he claims to have "
Sacerdotus replies: I will not be baited into providing information that I am not authorized to provide. Those interested, can look up the address themselves via Google or any other search engine and see what the results are. Moreover, those who subscribe to people search can also obtain other details. The posting of the information is not meant to bully anyone, but to show the seriousness of my quest to take down trolls. If "Ellif_dwulfe" is so concerned over this posting, then he should not have started this situation, hence "don't start none won't be none." Moreover, if "Ellife_Dwulfe" is so concerned with this information which he claims is not his yet he is worried about, then he should also petition "Rosa Rubicondior" and others to remove all references of a minor who she claims is me. I think this is fair, is it not? My about me has my CUNY record which clearly shows my name is not that of this Bronx minor. This is why I am not concerned with "Ellif_dwulfe's" and "Rosa Rubicondior's" misidentification of me. "So he declines. Note that all previous claims of police contact, legal action etc have all seemed to go no further thanclaims made by Sacerdotus. There's been (to my knowledge) no actual legal action or police action taken. As has been posted elsewhere: His "never did anything" seems to ignore the claims of child abuse made by him, the claims of theft and the hostile responses to criticism of his posts. As has been noted by others Sacerdotu seems to equate criticism of his blog posts or claims as a personal attack and trolling"
On the minor in question and child abuse:"I have made it clear numerous times that we do not know whether or not this male "Ellif_dwulfe" graduated high school or not. No high school diploma, transcript, letter from the high school itself has been produced by either "ellif_dwulfe" or "Rosa Rubicondior" confirming this. Instead, a link to the site Classmates is provided. Anyone who visits the site can clearly see that one can create an account easily without any barriers regarding verification. I can go now and created an account with a student named "Ellif Wolf," give him the age of 32 and then tell the world on my site that he is real and that he is "Rosa Rubicondior's" real identity. No one can be that stupid "ellif_dwulf." Until evidence from the school and/or Board of Education is provided that this male did graduate, is not a minor, then we must assume he is a minor since "Rosa Rubicondior" clearly linked him to a high school." Since we are to assume this kid mentioned a minor and "Rosa Rubicondior" is defaming him believing him to be me, then this is child abuse. She (Rosa Rubicondior" an adult is targeting and disparaging a minor. This is child abuse. Child abuse is not only about sexual abuse or physical abuse. Adults bullying, defaming, or yelling at children is child abuse. Since "Rosa Rubicondior" is defaming a child who she believes is me, then of course I am going to write a post calling out this child abuse. This is a no-brainer. On Theft etc:"Again, just like I was skeptical of "Rosa Rubicondior's" tweets directing people to her site in order to donate to Oxfam, so too was I skeptical of atheists asking for donations. This has nothing to do with any kind of refusal from anyone else to go on my podcast/radio program. This accusation is his inference, not base on facts. Let me add that it was "Gamma Atheist" who invited me to his broadcast, not the other way around. See: http://www.sacerdotus.com/2015/04/tax-fraud-atheists.html"
Again, as a skeptic I simply questioned the solicitation of donations or the attempt to become a middleman for them. If "Ellife_dwulfe" had bothered to view my studies, he would know that I studied journalism. Investigating and reporting on things is something I learned how to do. I put those skills into practice by bringing to the attention of others what I found suspicious. There is no reason for "Rosa Rubicondior" to become a middleman for Oxfam. All she had to do was forward people to Oxfam directly. I do the same whenever I write a post to donate to a nation that has suffered a natural disaster. Links and info is provided. I never ask anyone to buy things or donate via my blog, that is unethical. Moreover, "Gamma Atheist" is a young man capable of working. Why is he asking for donations? I am a critical thinker and skeptic. When things seem "fishy," then I will question them. Had "Gamma Atheist" been in an accident, lost his job and provided evidence of this, then I would not have questioned his request for donations. Moreover, another person implicitly expressed skepticism in this discussion on Twitter: https://twitter.com/jpak1888/status/459865923378483202, yet "Ellif_Dwulfe" is mute on this and instead uses my skepticism and inquiry to attack and defame me. Lastly, I offer no hostile response to anyone. I may be blunt and direct, but this is not hostility. "Ellif_Dwulfe" is a bit too sensitive if he cannot take bluntness. He would not last one day in New York City if he cannot handle a New York personality. Moreover, I welcome criticism of my content. However, what "Ellif_dwulfe" and his friends offer are personal attack, libel and character assassination. Calling me names, dissuading people from associating me, and misidentifying me is not the way of critiquing my opinions, and other content. That would be like Richard Dawkings boxing with William Lane Craig as his way of refuting Lane's arguments. This is not how you do it! As a matter of fact, I even started in March of this year "Atheist Open Mic" where I invite atheists to engage me live and in real time. This is how serious I am of being open to criticism and listening to contrary views and opinions. Once again, "Ellif_Dwulfe's" claims are unfounded. "My previous blog posts have disputed this before. Multiple times. Yes this blog quickly becamse someone specifically targeting Sacerdotus lies and attacks on others. Perhaps he should have considered:" Don't Start none and won't be one" before starting the personal attacks. The rest of his responses are repeats of pervious statements, all of which have been responded to before with links to his blog or tweets." Sacerdotus replies: Nothing was disputed by "Ellif_dwulfe." He simply restated his inferences which are based on conjecture, ignorance and spitefulness. The "don't start none won't be none" does not apply to me. Again, all this started after "Rosa Rubicondior" ran from debating me. Either she requested these people to jump on me and attack or they felt bad for her and decided to harassment out of retaliation. Because sacerdotus is a lying troll who harrasses and abuses other's including accuastions of stealing money intended for charity, child abuse and he posts personal information. If he'd have just kept with the anti-atheism blog posts I've have stopped responding to him a long time ago. I don't encoruage harassment. Even of someone like Sacerdotus. I don't encourage or act as an accomplice to defamation that would involve dishonesty on my part or the part of others. I do however encourage that the lies and false accuusations by Sacerdotus be refuted. I'm not aware of abuse towards sacerdotus. I'm aware of language & insults used that I wouldn't personally agree with but not to the point I'd consider it abuse. Especially as most of it focues on countering Sacerdotus abuse. I think by this Sacerdotus means why do i blindly accept what rosa says is true. I don't. i agree with some of Rosa states (especially for example when it's backed by screen images of payment confirmations and challenged by obviously edited/faked emails). I don't agree with some claims Rosa makes because he/she can't currently publicly support them." 1. "Ellif_dwulfe" accuses me of being a "lying troll who harasses and abuses" others but offers no evidence. He resorts to using conjecture and one-side inferences to justify his claims. Again, thousands are my witness that I did nothing wrong. This is why I am popular. Had I been what "ellif_dwulfe" describes, then my site etc would have failed a long time ago. In my previous replies, I answered "ellif_dwulfe's" claims that I accuse people of stealing money, accuse them of child abuse and post personal information. 2. On many occasions, "Ellif_dwulfe" has encouraged harassment against me on Twitter by engaging in long twitter discussions which are publicly available. Despite the aforementioned making his Twitter account private, his tweets and the tweets showing discussions targeting me are available and documented. Also see: https://twitter.com/Ellif_DWulfe/status/523048442415685632 where he has a link pinned targeting me for abuse and defamation. As you can see, he is clearly engaging in and encouraging harassment. 3. Nothing I have stated is false, this is why I can easily provide evidence. Again, "ellif_dwulfe" seems to think that what he decides is false is in fact false. It does not work this way. His conjecture only is valid in his head and not reality. Posting things whether true or not is still libel if the intent is to harm the reputation of another. To date, nothing factual has been presented by "ellif_Dwulfe" or his friends regarding me. It is no wonder why he targeted the atheist blogger "Studious Atheist" since this young man actually provided documentation showing "Rosa Rubicondior's" claims are fabricated. Luckily, this blogger had back-up blogs. I too saved the content and will use some of it to make another case against "Rosa Rubicondior." 4. There is nothing to dispute since hard evidence is on my side. "Ellif_dwulfe" can say the universe is white, but that is only his delusion because we know it is not white. The facts are not open to manipulation. 5. As demonstrated above, "Ellif_dwulfe" is clearly aware of the harassment and abuse. He participate in it. Not once has he rebuked his friends over it which shows his lack of moral character. As stated before, he wants to be "part of the group" like a teenager in high school trying to impress the bigger popular kids in order to "fit in" even if it means betraying principles. 6. Nothing "Rosa Rubicondior" states is true. Recently, I refuted a blog post where she attempted to use a psychology journal article to claim that Catholic visionaries are psychotic. Moreover, her posts on "Sacerdotus" are fabricated and have no supporting evidence. "Screenshots" are not evidence as they can be created in photo shop. This is why I am happy my friend Susan introduced me to "Studious Atheist's" blog where I saw how much effort this young many put to show hard evidence that "Rosa Rubicondior" and her friends have been making things up in order to assassinate my character. Not once has "Ellif_Dwulfe" publicly rebuke "Rosa Rubicondior" for making claims she could not back up with hard evidence. Not once has "ellif_dwulfe" written posts on "Rosa Rubicondior" publicly since he claims things should be made public: "makes false accuastions publicly so the refutations are more appriopriately public." You can clearly see that his vendetta is with me. He wants to solely target me and leaves "Rosa Rubicondior" and his other friends untouched. This shows his lack of integrity and bias. He could never serve on a trial because he is not fair nor impartial. "Ellif_dwulfe" would decide guilty if the defendant were a theist and not-guilty if the defendant were atheist without ever considering the facts and evidence. "Which are, to be honest, valid concerns. If i suspected that the named person is a child I would ask them that the name not be mentioned. But since there's no reason to suspect they are a child by what Rosa has posted and people search results, and since the link of the name and school are publicly available (unlike an address for "Ellif D'Wulfe) I don't personally see a problem. Especially as Sacerdotus claims that "Manny" didn't go that school as it was closed when "Manny" would have gone and that he has proof "Manny" didn't go there (on his studiousatheist persona's blog). If that's the case as he claims why the worry about the name & school being mentioned?" "Ellif_dwulfe" of course went mute and never answered. The information on People Search does not state, "Manuel De Dios Agosto" nor "Manny." Neither does it mention Grace Dodge Highschool. These are all factors "Rosa Rubicondior" put in her post defaming me. Yet "Ellif_dwulfe" is confident that this information is related. Do you see the irrationality here? "Manuel D. Agosto" can be "Diaz, De'la, Della, Donald" etc. Moreover, I have already stated that Classmates is not verifiable. Anyone can make an account. The school does not have a website, to my knowledge. Classmates is a private company that offers graduates a network in order to keep in touch. It does not serve to identify or confirm graduates of any particular school. The address I have for "Ellif_dwulfe" has been confirmed by the appropriate parties in Kent, UK. I also have phone numbers, and other information which I will not post as these are private and only obtainable via the proper channels which I have access to. Lastly, "ellif_dwulfe" claims that the "Studious Atheist" blog is mine, yet offers no evidence of this. He has yet to post a letter from Google inc indicating that I own that blog. Instead, we are left to believe him because "Rosa Rubicondior" said so. This is ridiculous and shows how stupid this character is. He cannot think for himself. Moreover, I am not worried about any name or school being mentioned. I simply brought up this minor to address "Ellif_dwulfe's" hypocrisy. He is concerned over an "address that is not his" but is silent over a minor who is being defamed by his friend. That was my point. If this minor's parents or child services does contact me for any court related issues, then I will be happy to testify against "Rosa Rubicondior," "ellif_dwulfe" and their friends. This is how confident I am that I can prove my real identity. When I created my Twitter account and blog, I did so with the intention of building bridges between Catholics and non-Catholics. Putting aside the disputes over who said what, who claimed what etc about oxfam etc. Does anyone genuinely get this impression from a quick look at the post titles on Sacerdotus blog or his tweets? Sure he posts some interesting catholic related articles, he even posted a good one about autism a time or 2 but the atheism related ones seem less about a connection with atheists and more just telling them atheism and atheists are stupid. I suppose it was naive on my part to expect him to consider my request but I had to try. Incidenly as studious atheist is again active (just as sacerdotus starts the personal attacks on me with posting of personal information and just as The Apatheist suddenly wakes up) I wonder if he's finally removed all the staples from that yearbook and can post it's interior. Sacerdotus replies: My words still stand. I never intended for any of this to happen. Again, "Rosa Rubicondior" became vindictive after she was humiliated and began this attack against me. "Ellif_Dwulfe" and her friends either joined in out of pity or by her request. In any event, they all will go down together since they are the only ones so far engaging in this harassment. "Ellif_dwulfe" clearly does not understand that my posts on atheism are are meant to be solely on atheism, not atheists. They critique the ideology. His observation is based on his weak comprehension skills and cognitive bias. In regards to any requests, as long as "ellif_dwulfe" and his friends continue their harassment and their defamatory and libelous blogs and posts, I cannot do a thing. It is in the hands of legal professionals now. They will decide what laws are applicable and when to take down the posts and accounts. Lastly, we see "Ellif_dwulfe" exhibiting signs of schizophrenia which are paranoia and the belief that he is being stalked, spied on based on fantasies in his mind. He needs professional help. Hopefully the legal proceedings will bring attention to this so that he will not be a danger to himself or others. In closing, "Ellif_Dwulfe" et al have been nothing but abusive towards me without merit. He is part of a group that targets me and whom only exist to assassinate my character. This seems to make him feel "part of the group," so to speak. Moreover, he claims the address posted is not his, yet he is showing concern over its posting on the grounds that the people who live there may be targeted. However, why has he not told "rosa Rubicondior" and the others to remove the mentions of this 15-year-old male who "Rosa" claims is me? Does he not think this kid may be targeted? He claims the kid is a grown up, but how does he know this? What if this kid is not a grown up and is in high school now as I write this? Does he think it is safe to post online the name and school of a minor? Did he ever consider that this kid may become a target of school bullies based on this unwanted publication from "Rosa Rubicondior?" Has he ever considered that I can be summoned to court if this kid's parents ever file a lawsuit against "Rosa Rubicondior?" Since the topic of the post is "Sacerdotus," the court will subpoena anyone using that pseudonym. If this kid is of age, has "ellif_dwulfe" ever consider that the posts mentioning him may effect his life? Where is "ellif_dwulfe's" concern? "Ellif_dwulfe" is clearly a hypocrite who is blinded by his need to feel "part of the group." He indeed is the "blind wulfe." I am not nor ever been a bully. 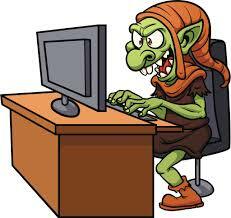 I am merely a guy who is exposing trolls so that others can know about them and avoid them. When I created my Twitter account and blog, I did so with the intention of building bridges between Catholics and non-Catholics. I had no idea I would become the target of a deranged group who create accounts under the guise of atheism. Moreover, I had no idea this group would follow me around the internet in order to discourage others from engaging me or causing confusion regarding my identity. The real bullies and abusers here are "Ellif_dwulfe" and his friends, not me. Everything is documented and I have many witnesses. As a Christian, I tried to remedy the situation by contacting these trolls and resolving this amicably via email and invitations to Skype & Google Hangouts, but they took it as a game and continued their abuse without any sign of ending. I had no other alternative than to contact the authorities and a law firm which I have a right to do. It is funny to see these atheists whining and claiming to be the victim. It goes to show you how far gone these people are psychologically speaking. They cannot see that they are the initiators of this abuse and the promoters of it. As the saying goes, "Don't start none won't be none." They started this and I will end it one way or another.